Going through a divorce can be a trying experience, whether you're on good terms with your spouse or not. Even if the divorce is mutually agreed on and the marriage is coming to an end on good terms, things can get messy when it comes to assets, alimony, and custody if children are involved. Because of this, it's a good idea to turn to an experienced family law attorney for help. No-fault divorce is a type of divorce where you can request a divorce without having to provide evidence that your spouse did anything wrong. A no-fault divorce isn't available in all states, but it is here in Florida. Additionally, in some states its involved but only following a legal separation. You can get a no-fault divorce right away in Florida. A no-fault divorce can be very beneficial to couples who want to split amicably. To be able to file for a no-fault divorce, you have to prove that your marriage is valid, that the marriage is beyond repair and that one of the spouses needs to be able to prove that they've been a resident of Florida for at least six months. A no-fault divorce is considered a type of uncontested divorce. A contested divorce is much more complicated. It occurs when the spouses are unable to come to an agreement on the terms of their divorce, whether it's child custody, the division of property, the division of assets, alimony or child support. In such a situation, it's invaluable to have a lawyer. A family law attorney can help negotiate terms with your spouse to come to an agreement. If not, the lawyer can help make your case in front of a judge, who will then determine the settlement terms. A contested divorce can get very messy, and many spouses will often lose track of what it is they want. A family law attorney can help keep you focused to prevent you from making decisions based on emotion that could cause the divorce to drag on longer than it should and that could cost you should a judge be forced to make a decision regarding the terms of the divorce. In Florida, if a mother has a child out of wedlock and both parents do not sign an acknowledgement of paternity at the hospital at the time of the birth, then that child will not have a legal father. Here at The Law Office of Susan Chesnutt, we offer representation to both fathers and mothers in regards to establishing paternity. Establish paternity may seem like a challenging task, whether you're a father and you want to claim your parental rights or you're a mother seeking to locate the legal father of your child. Not only can we provide legal advice based on our years of experience dealing with paternity cases, but we can also help you find timely resolutions for all family law-related issues. Making it easy for the child to access family medical history when they are older. Giving the child the opportunity to know who their father is. Giving the child potential access to health insurance if it's available. Ensuring that child support and medical support is received to help raise the child. Our paternity services are both timely and affordable. The paternity lawyers here at FFLC can help you establish paternity inside and outside the courtroom in many different ways. We will guide you through the process of establishing paternity based on your unique situation. If you're planning on getting divorced from your spouse, then you should turn to an experienced family law attorney for legal guidance. A good family law attorney will help guide you through the divorce process, whether it's a contested or uncontested divorce. Here at The Chesnutt Law Firm, we have significant experience working with families. It's important that you choose someone that's not only experienced in family law, but that has a reputation for being able to provide professional advice in an emotionally supportive way and to ensure that everything is done in your best interests. 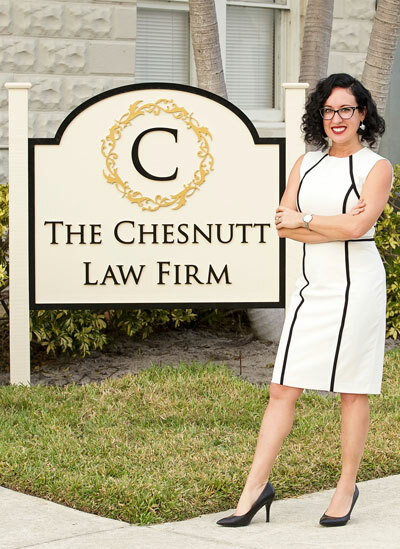 If you have decided to file for divorce, whether it's a no-fault divorce, a contested divorce or a non-contested divorce, then you should contact us at The Chesnutt Law Firm for a case evaluation by calling us at 772-492-3330 today. All information on this site is information only. Nothing on this site constitutes legal advice or establishes an attorney-client relationship. Every case is different, and for advice on your specific case contact a licensed lawyer in your area. The information on this site is provided only as general information and may not reflect the most current legal developments or the law as it pertains to your jurisdiction. Any third party businesses mentioned are for example purposes only and are not mentioned as an endorsement. No business pays to have their business mentioned on our site.